Modern, large-scale analog integrated circuits (ICs) are essentially composed of metal-oxide semiconductor (MOS) transistors and their interconnections. As technology scales down to deep sub-micron dimensions and supply voltage decreases to reduce power consumption, these complex analog circuits are even more dependent on the exact behavior of each transistor. High-performance analog circuit design requires a very detailed model of the transistor, describing accurately its static and dynamic behaviors, its noise and matching limitations and its temperature variations. The charge-based EKV (Enz-Krummenacher-Vittoz) MOS transistor model for IC design has been developed to provide a clear understanding of the device properties, without the use of complicated equations. All the static, dynamic, noise, non-quasi-static models are completely described in terms of the inversion charge at the source and at the drain taking advantage of the symmetry of the device. Thanks to its hierarchical structure, the model offers several coherent description levels, from basic hand calculation equations to complete computer simulation model. It is also compact, with a minimum number of process-dependant device parameters. the high-frequency model, setting out a complete MOS transistor model required for designing RF CMOS integrated circuits. 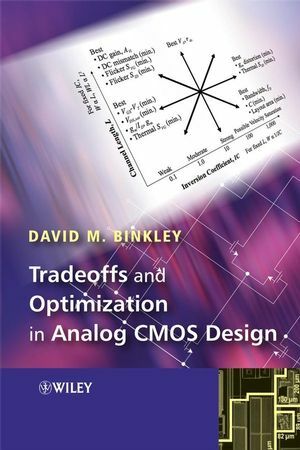 Practising engineers and circuit designers in the semiconductor device and electronics systems industry will find this book a valuable guide to the modelling of MOS transistors for integrated circuits. 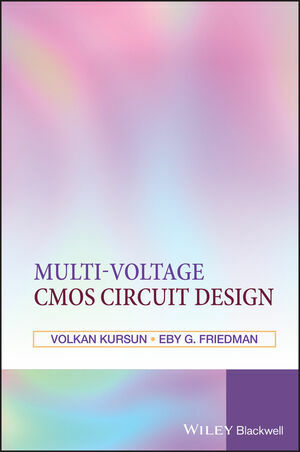 It is also a useful reference for advanced students in electrical and computer engineering. 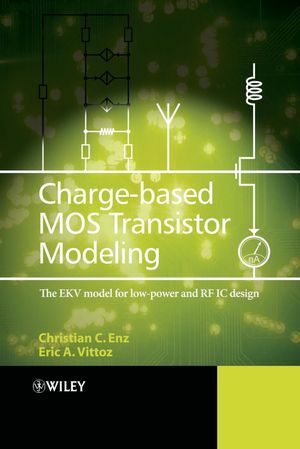 Christian C. Enz and Eric A. Vittoz are the authors of Charge-Based MOS Transistor Modeling: The EKV Model for Low-Power and RF IC Design, published by Wiley. 1.1 The Importance of Device Modeling for IC Design. 1.2 A Short History of the EKV MOST Model. PART I: THE BASIC LONG-CHANNELINTRINSIC CHARGE-BASED MODEL. 2.1 The N-channel Transistor Structure. 2.2 Definition of charges, current, potential and electric fields. 2.3 Transistor symbol and P-channel transistor. 3. The Basic Charge Model. 3.1 Poisson’s Equation and Gradual Channel Approximation. 3.2 Surface potential as a Function of Gate Voltage. 3.5 Density of Mobile Inverted Charge. 4.2 Forward and Reverse Current Components. 4.4 Model of Drain Current Based on Charge Linearization. 4.5 Fundamental Property: Validity and Application. 5.1 The Static Small-Signal Model. 5.2 A General Non-Quasi-Static Small-Signal Model. 5.3 The Quasi-Static Dynamic Small-Signal Model. 6.2 Low-Frequency Channel Thermal Noise. Appendix : The Nyquist and Bode Theorems. Appendix : General Noise Expression. 7. Temperature Effects and Matching. PART II: THE EXTENDED CHARGE-BASED MODEL. 8. Non-Ideal Effects Related to the Vertical Dimension. 8.2 Mobility Reduction Due to the Vertical Field. 8.4.1 Definition of the Effect. 9.3 Drain Induced Barrier Lowering. 9.4 Short-Channel Thermal Noise Model. 10.1 Extrinsic Part of the Device. 10.4 Source and Drain Junctions. PART III: THE HIGH-FREQUENCY MODEL. 11. Equivalent Circuit at RF. 11.1 RF MOS Transistor Structure and Layout. 11.2 What Changes at RF?. 11.3 Transistor Figures of Merit. 11.4 Equivalent Circuit at RF. 12. The Small-Signal Model at RF. 12.1 The Equivalent Small-Signal Circuit at RF. 12.3 The Large-Signal Model at RF. 13. The Noise Model at RF. 13.1 The HF Noise Parameters. 13.2 The High-Frequency Thermal Noise Model. 13.3 HF Noise Parameters of a Common-Source Amplifier.